Join the discussion on our forums! Come discuss Master's Call over in our dedicated Master's Call discussion topic. Discover a minion in your deck. If all 3 are Beasts, draw them all. "Hello? Yes, this is Huffer." This is hands down the most ridiculous card for Hunter decks right now outside of Zul'jin. For 3 mana, it gives Hunters what they have been missing: card draw. Sadly, the discovery needs to choose 3 DIFFERENTS minions, so it will only draw 1 with Frenzy. Realy good with Barnes in Wild Spell hunter on the other hand. If true, it... would explain some of the issues I've seen with this card. Like, I only have Beasts in my beast-deck, I specifically don't use Houndmaster to maximize this card's value, but its track record on drawing 3 cards is pretty spotty in games I KNOW I have 3+ minions still in my deck due to Dire Frenzy. Sometimes when I play this and have 3 beasts only in my deck, and no other kind of minions it will just draw two beasts, I am 100% sure of this. Same here, I had 8 beasts on my deck and "Master's Call" only drawned to my hand 2 beasts. Could this happen due a bug? dang this cards interactions confuse me! But hey, even if not, there are still Dire Frenzyshenanigans to be had. I used this card 3 times. I have Shaw as the only NON beast minion. All 3 times he was in Discover. The card can see some play in Spell Hunter. Play Animal Companion, play Dire Frenzy then draw all three beasts with this, so your Rhok'delar and To My Side! are still playable. You can draw exactly Halazzi, the Lynx, Subject 9 and something like Timber Wolf for example. Seems quite strong! So, what would happen if there are only 2 minions left in the deck, and both are Beast? As it says "if all 3 are beasts", would it break that condition by them being only 2? If not the case, then running only 3 beasts could work well, if those are the only beasts you need for some particular reason. If it is indeed the case, then running more than 3 beasts could be a good idea, just in case you draw some of them, to still fulfill the "all 3 are beasts" condition. Good card if you can build a deck around it. Got a couple so far I've tried. Thoughts? Damn, didn't think about it. Wild becomes more broken every expansion. 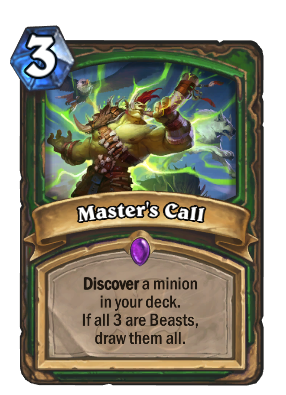 Hold up, so if all three are beasts, do you still get to keep what you discovered as well as drawing 3 cards? Does this give you 4 cards total? You'll draw the 3 options INSTEAD of discovering one. "Discover a copy of minion in your deck. If all 3 choices are Beasts, keep all copies instead." - If they want to create copies. So if I run only beasts as my minions there is 100% to draw 3 minions for 3 mana. I feel that this is a good enough to cut other minions, since I can play my secrets, DK and weapons... Maybe I would like to keep Kathrena Winterwisp in my deck, she would be like Pathces.